Duke vs. Michigan State: What it’s like to beat college basketball’s most hated program, in the words of the men who did it. What it’s like to take down college basketball’s most hated program, in the words of the men who did it. West Virginia’s Joe Mazzulla celebrates scoring against the Duke Blue Devils during the second round of the NCAA Tournament on March 22, 2008. This weekend Duke plays Michigan State for a spot in the NCAA Championship. In 2013, Alan Siegel talked to seven players, including former Spartans guard Maurice Ager, about what it’s like to beat the most-hated team in college basketball. His article is reprinted below. Duke and coach Mike Krzyzewski have won four national championships. They’ve also lost in the NCAA tournament 24 times in the Coach K era, to the great delight of the nation’s legions of Blue Devil haters. We asked seven players and a coach to explain what it’s like to topple Duke during March Madness and whether Greg Paulus was as annoying as he seemed on TV. In 2008, No. 7 seed West Virginia beat No. 2 seed Duke 73-67 in the second round. Mazzulla, a relatively unheralded sophomore guard, nearly had a triple-double, finishing with 13 points, 11 rebounds, and eight assists. Everybody knows that the biggest thing about Duke is they slap the floor on defense. I was sitting with [teammate] Joe Alexander and we said, “If we get in that situation, why don’t we do it?” We may never play them again. So we make our run, and I’m in front of the bench, and I do it. I couldn’t see behind me. I don’t know if Joe Alexander did it, but I think that’s what got [Duke] going for the 2010 game. [Duke beat West Virginia in the 2010 Final Four.] I’m sure Coach K played that up a lot, and I’m sure that fired them up. They were up [18-8], and I’ll never forget Greg Paulus was obviously talking smack and saying it was about over. For me, personally, Greg is—I didn’t really talk to him, I only played against him that one time—he’s one of those guys. I think he really likes to get under other people’s skin. The thing about that was that that was my role as well. So it was pretty much a battle of both of our roles. You had to stand up to him. And as the game went on, it turned. D.C. [where the game was played] is very pro-West Virginia—there’s a big alumni base there. As the game went on, it turned more into a West Virginia atmosphere, especially the last six, seven minutes. As a player I didn’t like [the Blue Devils] very much, and now I’ve been coaching for two years and I love everything about what they do and what they stand for. When you’re a competitor you almost hate them for how good they are. Scotty Thurman (far left) and his Arkansas teammates celebrate beating Duke to win the national title in 1994. In the 1994 national title game, Arkansas—then-President Bill Clinton’s favorite team—toppled Duke 76-72. Thurman, a sophomore guard, hit a go-ahead three-pointer with 50 seconds left to win the game for the Razorbacks. At that age, you want to go up against the best and have a chance to beat the best. For us, we felt like we had never received the respect we were supposed to. It was one of those deals where—here was another opportunity to prove that. For us, it was kind of like everybody thought they were going to beat us. We wanted to prove everybody wrong again. Coach [Nolan Richardson] kind of instilled an attitude in us that we were nomads. We didn’t perennially have all the McDonald’s All-Americans and didn’t necessarily have the big-name guys. Yet still we felt like we had a pretty good team. Going up against Duke, Coach K has done it for so long, they had great teams and gone to numerous Final Fours, had a chance to win some championships. The biggest memory for me—outside of making that shot and winning the national championship—was that day somehow there was a mix-up with our shoot-around times. We got to the gym—usually a lot of times we’d go to the locker room, use the restroom or whatever, and kind of mess around for a few minutes of lag time before coach would actually want you out there ready to go. We got there, and our time was dwindling down. We had like, three minutes or so. I don’t even think we had three minutes. By the time we made it to the floor, it was like a minute-and-a-half or something. Guys were shooting a lot of rushed shots. I’m like, What’s going on? I think I had my headphones on. And all of a sudden I looked up at the clock and said, “Dang, we don’t even have any shoot-around time.” People were walking around there, getting ready for the president coming and setting up all the theatrical stuff that goes along with that, and I hear coach going off in the tunnel the whole time we were on the floor: “Nobody wants us to win. This was not supposed to happen. We thought we had the right shoot-around time.” Those kind of statements were being made, so it just kind of added fuel to the fire. We felt like we were going to win the game. I didn’t think that I’d be faced with a last-second shot opportunity and have to make that shot. The crazy thing about the play is Dwight Stewart, who was our center, he fumbled the ball, but he had the presence of mind to gather himself and to pass it. I think most guys would probably take an ill-advised shot. So when I saw him bobble the ball, I looked at the clock. I knew that when he did pass it, somebody—whoever caught it—was going to have to shoot. So it was probably in my mind that I was going to shoot, so I caught it, I just shot it, and it just so happened that [Duke forward] Antonio Lang—most people look at that photo and they see how close he was, because of the angle of the photo it looks like he could’ve blocked the shot. I’ve always disputed that, because I’ve got another photo that shows that the ball had already been released. He was close, but he wasn’t as close as the picture everyone sees in Sports Illustrated. Had he not jumped so far, he probably could’ve blocked it. But he kind of jumped from quite a bit of distance, so he was actually on his way down, and the ball was already gone. He wasn’t that close, but he was close. He was very close. 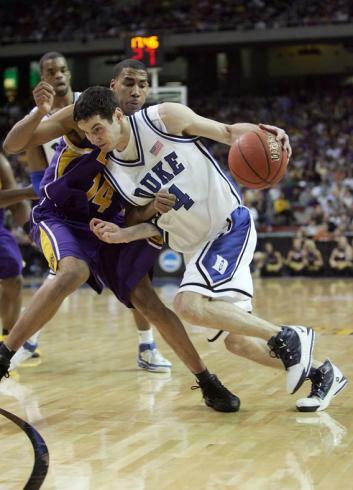 Duke’s J.J. Redick dribbles against LSU’s Garrett Temple during third round game of the NCAA Tournament on March 23, 2006. In 2006, No. 4 seed LSU beat No. 1 seed Duke 62-54 in the Sweet 16. The Tigers, who were led that season by Glen “Big Baby” Davis and Tyrus Thomas, won the game in large part due to the defense of freshman Temple, who held J.J. Redick to just 11 points in his final college game. Temple now plays for the Washington Wizards. When we saw that we were a No. 4 seed, we kind of felt a little disrespected because we won the [SEC] outright that year, and Tennessee, who was behind us, they ended up getting a No. 2 seed. But we knew we were going to have a chance to play Duke if we won our first two games. And we knew we wanted to show the nation what type of team we really are. I knew I was going to have a chance to guard one of the best shooters in the game. Of course I was really excited about that. [J.J. Redick] ran off screens a lot. [Duke forward] Shelden Williams set a lot of screens for him. His whole team set a lot of screens for him. The offense basically was designed to get him the ball. The toughest thing was just to keep up with him and just continue to put a hand in his face when he lets the ball go and hope he misses it. He missed a few of them, so that was good. In the second half, a few times, he tried to tangle us up on purpose, putting his hand in my jersey and also complaining to the refs and throwing the ball against the pad [underneath the basket]. He never said anything to me, but I could tell he was frustrated. It’s either love or hate. There’s no in-between with Duke. A lot of guys on my team, coming from where we came from, you just don’t relate to guys from the Duke team. So obviously it was a hate relationship with us, whether we were playing against them or not, or just being fans. You have to have confidence in order to be at the top. They definitely had the confidence. It seemed like once you got past that confidence, that year they were beatable just like anybody else. Once we found that out, we knew what we had to do to win the game. Somebody tweeted about the game and put up a link to it three months ago. I was bored and actually clicked on it and watched the game. At the end of the game, when Tyrus [Thomas] went the full length of the court and dunked it, that was the dagger. His enthusiasm in that game was incredible. We shook hands, and I remember Coach K just saying, “Great job, young man. Great job,” to me personally. And J.J. and Shelden shook hands with us. I still see J.J. now, playing against each other [in the NBA]. We definitely talk more than people who haven’t played each other before. I wonder if when J.J. was in Orlando, if him and Glen [Davis] talked about that game at all. 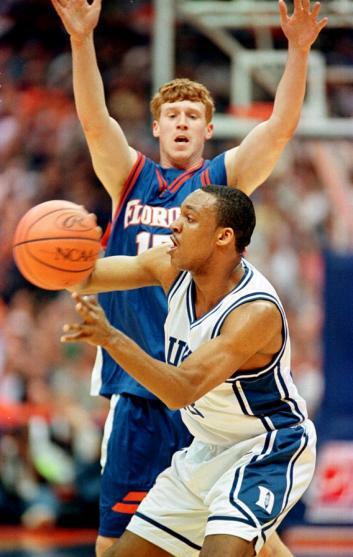 Florida’s Matt Bonner plays defense as Duke’s Chris Carrawell passes the ball during the 2000 NCAA Tournament. In 2000, No. 5 seed Florida upset No. 1 seed Duke 87-78 in the Sweet 16. Bonner, a freshman who now plays for the San Antonio Spurs, scored eight points. I remember probably more so than any game in my college career—our team was just really revved up, amped up, excited, pumped up for that game. I remember coach [Billy] Donovan took the motivational approach, making us believe that we had already won the game before it even started. We stepped on the court full of confidence and played that way, and we pulled off the upset. It was a Sweet 16 game, so we had several days to prepare. You can’t put it into words. During two lines of layups, everybody’s going full speed, dunking it every time. You know, staring down the Duke players [while] running back to the rebounding line. Stuff like that. We really came out with an edge. It was just a mindset you created going into that game. You could argue this, but definitely for my generation, they’re the greatest program in college basketball. If you look at their consistent success, and obviously having Coach K as your head coach is a huge part of that. He’s a legendary coach, and he really gets the most of his players year in and year out. They’re always a contender. It’s kind of like how most baseball fans don’t like the Yankees. As someone who played college basketball and now play in the NBA, I love running into Duke guys and busting their chops about Duke. It’s one of those things. We have an assistant coach, Chip Engelland, who went to Duke. Every time Duke loses, I shoot him a text—“Hey did you catch the Duke score? I missed it,” or something like that. That’s kind of my ace in the hole, for sure. No matter what happens, no matter what we’re joking about, I can always go to that. But all of that is out of respect for the program, really. That’s why you have the Duke haters out there, because they’re so successful. Everybody wants to beat Duke. They get everybody’s best shot every game. I was a freshman from New Hampshire, and there I am playing in the Carrier Dome, packed, in the Sweet 16 against the No. 1 team in the NCAA tournament and pulling off the upset. It almost didn’t feel real. 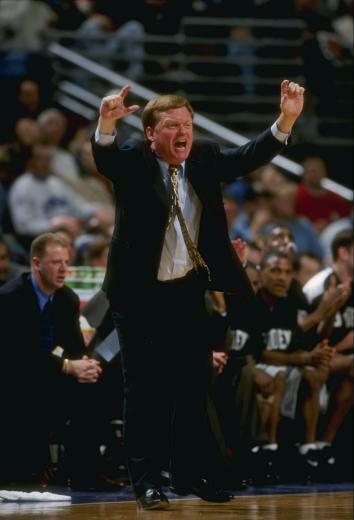 Providence coach Pete Gillen on the sidelines during a game against Utah in 1997. In 1997, en route to the Elite Eight, No. 10 seed Providence upset No. 2 seed Duke 98-87 in the second round. Now an analyst for CBS Sports Network, Gillen presided over a talented squad that featured Derrick Brown (33 points) and future pros Austin Croshere (21 points) and God Shammgod (12 points). We had to attack. We had to be aggressive, because they were very aggressive. Steve Wojciechowski, their point guard, who’s an assistant [coach] with Duke now, first play of the game, he bumped into [Shammgod], kind of chest bumped him a little bit. [Shammgod] looked at him. He didn’t back down. He’s a tough kid from New York City. Wojciechowski was a tremendous college player, but Shammgod responded well. We just had to be aggressive. We had a very talented team. We had God Shammgod, and when you’re coaching God, it’s tough to lose. God Shammgod was our point guard, and Austin Croshere, who was a lottery pick, was our great forward, 6-foot-9, a skilled four-man. We had athletic wings, a guy, 6-foot-5, Jamel Thomas, he was very, very good. Derrick Brown was the other wing. Derrick Brown was just the Terminator. He didn’t care. He was going to get his points, his rebounds, no matter what. He was just tough as nails. He was just too quick for Trajan Langdon or whoever they had on him. We wanted to attack them. We were a little more athletic than them. They were a great team, eighth in the country coming in, so I remember that. Honestly, we were just a little more talented team that year. We certainly respected Duke, they had a great team, but we felt that we could beat them if we bring our “A” game. [The fans] were pro-Duke to start, because they had a big Duke contingent. We had, you know, a couple guys on a business trip who came down from Providence. I’m just kidding. We had a few fans there. Providence has a great tradition. They love their basketball at Providence. Once we showed that we could compete, a lot of the fans who were Duke alums or whatever, they jumped on our side, because we were a big underdog in that game. They were kind of stunned that Providence, that finished sixth in the Big East that year, could play with a great Duke team. We were blessed with a lot of talent. It wasn’t coaching. We had good players. They weren’t afraid. Villanova’s Scottie Reynolds and Duke’s Gerald Henderson fight for a loose ball during the NCAA Tournament on March 26, 2009. In 2009, No. 3 seed Villanova destroyed No. 2 seed Duke 77-54 in the Sweet 16. Junior guard Scottie Reynolds scored a game-high 16 points and helped stymie the Blue Devils, who shot a paltry 26.7 percent from the field. For us, it wasn’t really a blowout. You know, we had great respect for Duke. Not just for that year, but as a program. We had to continue to play hard the whole 40 minutes because we’d seen on film—and through the years—that if you let up for two minutes, they can come right back into the game. You don’t fear anybody, but you respect everybody. And I think with Duke, you respect them a ton. I knew Gerald Henderson, Nolan Smith, and Kyle Singler. I knew what type of players they were. But when we went in there and played them, it was kind of like, we had so much respect for them, it wasn’t like a fear thing, but it was like, If we don’t come in and play a good, solid basketball game we could get embarrassed. We just had total focus. I knew Nolan, I knew Gerald, I knew Kyle, so you hear those three names, you just try to make it hard on them. But you think they’re going to get a certain number [of points]. The way we just came out and played defense—we held Gerald to something low [seven points on 1 for 14 from the field]. We felt really good at halftime, and in the second half we knew they were going to make a run. When Greg Paulus came in, he kind of turned the game a little bit, because he put a lot of pressure on us offensively and defensively. We had to regroup and buckle down again. I think defensively—and if you hear the remarks from Coach K at his press conference—I think that was one of the best defensive games we played, considering the talent that they had. I know we hadn’t had a defensive game like that against three NBA-talented players. I remember one play where [Duke guard] Elliot Williams came down, and he dunked it with his left hand, and-one—and I think he was a freshman at that time—and I was like, Oh. How many more of these guys do they have on their bench? I can see why they have a lot of firepower, and I don’t know if a lot of teams have that. When they substitute their starting five out, you know, their second five would probably start for anybody else in the country. The only way we could compete with them was to respect them. That Duke game was special in the sense that we accomplished it together. It wasn’t anybody individually. It’s hard to explain, but when you play against Duke, you never want to be that team where they’re smacking the floor and you get run out of the gym. I guess we didn’t want that to happen. 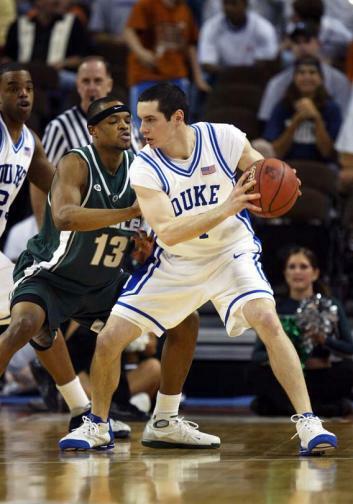 Michigan State’s Maurice Ager pressures Duke’s J.J. Redick during the NCAA Tournament on March 25, 2005. In 2005, No. 5 seed Michigan State beat the top-seeded Blue Devils 78-68 in the Sweet 16. Ager’s transition dunk over J.J. Redick was the day’s most spectacular highlight. I think about some of the things that led up to that game. I just remember being in my room at one point, me and [teammate] Drew Neitzel, watching the news and highlights and stuff—they were basically talking about how Duke beat us earlier that year at Cameron [Indoor Stadium]. The biggest thing they were talking about, they were saying we were scared. We were like deer in the headlights. I remember that phrase. A lot of our motivation came from those interviews prior to the game. I feel like once you reach a certain stature when you’ve won so many games and championships, you become the bad guy. It happens to the best of them. There’s only so much before people start looking at you as the bully. The Lakers, the Cowboys, the Bulls in ’96. It’s nothing new. Those [Duke] guys are great, man. I think Coach K’s obviously a great coach. Not only a great college coach, he’s a great pro coach. He keeps winning these championships and these gold medals. J.J. was tough. He could shoot, he’s tougher than people think he is, or was back then. We did a really good job on the scouting report. I guarded him the majority of the game. I just made sure I stayed on him. I made sure he didn’t get any open looks. I just chased him and did what I could to keep up with him. I think the dunk just sealed the deal. I can’t even go on Twitter—once every week, somebody brings it up again, you know, talking about my dunk on J.J. Redick. It was fun, man. After it happened, I think it took a big wind out of Duke. I just wanted to finish. I just wanted to finish. I didn’t realize it was going to happen like that. I didn’t think [Redick] was going to try to take a charge. Obviously it turned out pretty good. [Laughs] I remember pounding my chest, man, and getting back on defense. 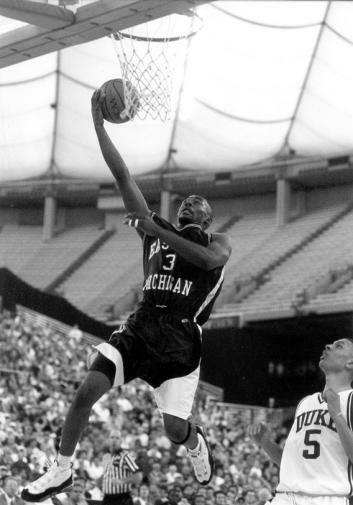 Derrick Dial soars to the basket against Duke in the 1996 NCAA Tournament. In 1996, No. 8 seed Eastern Michigan beat No. 9 seed Duke 75-60 in the first round. Five-foot-5 point guard Earl Boykins, who went on to play in the NBA for a decade, scored 23 points for Eastern Michigan. His teammate Dial, a future pro himself, added 12. What was really strange, when you got there—the game was in the RCA Dome—it was very, very quiet. There was a game going on before us. So how can it be so quiet? Then they opened up the doors, because we’re getting ready to head to the court, and it was ridiculously loud. It was almost deafening. It was a different intensity, a different everything. You’re so hyped up—you actually have to calm yourself down. And then it’s weird when you actually play the game, because the crowd turns on the favorite and starts to root for the underdog. It’s an atmosphere. When you think about teams that have the history, Duke is one of those teams—you always appreciate what they do on the court—but you really want to beat those teams, because it’s almost like a validation that you’re a good team. You always want a chance to play against them. I remember our coach saying, “Don’t focus on the letters on the front of the chest. Don’t get caught up just ’cause it’s Duke.” If you do, you really can become overwhelmed. You just go out there and prepare like you always have. And you settle down right after that. It’s amazing how after the jitters clear, you settle down. They had Wojo [Steve Wojciechowski missed all but three minutes of the game with a sprained ankle] and they had [Trajan Langdon]. It’s amazing that with a more noted school, when they know they’re in for a dog fight, they try to buckle down, to land that knockout punch, but when they can’t do it, actually you can send them reeling. That whole week, [we said], “We can beat them.” People say it all the time, but they don’t mean it. But we actually felt we could win. We really pulled away from them. It wasn’t close. I didn’t think it was going to be that bad, but we always thought we could win. I remember shooting the ball, missing it, and tip-dunking my own rebound. It was an and-one. And you see Coach K go ballistic. You say, “On TV he looks so calm.” But, wow, he’s not that calm. He went off! I mean, he was upset. And he really was laying into his team. He was trying to get them to, I guess, execute. You see him on TV and he looks calm. He was anything but calm. Everything is on national TV. It’s what it’s all about. You remember smiling ear to ear, and we were the story of the tournament for about two hours. And then I think it was Princeton beat UCLA. And they were the story. It’s crazy how things happen in the tournament. It’s really March Madness. I know people say it all the time, but to really experience it? It is really crazy out there.